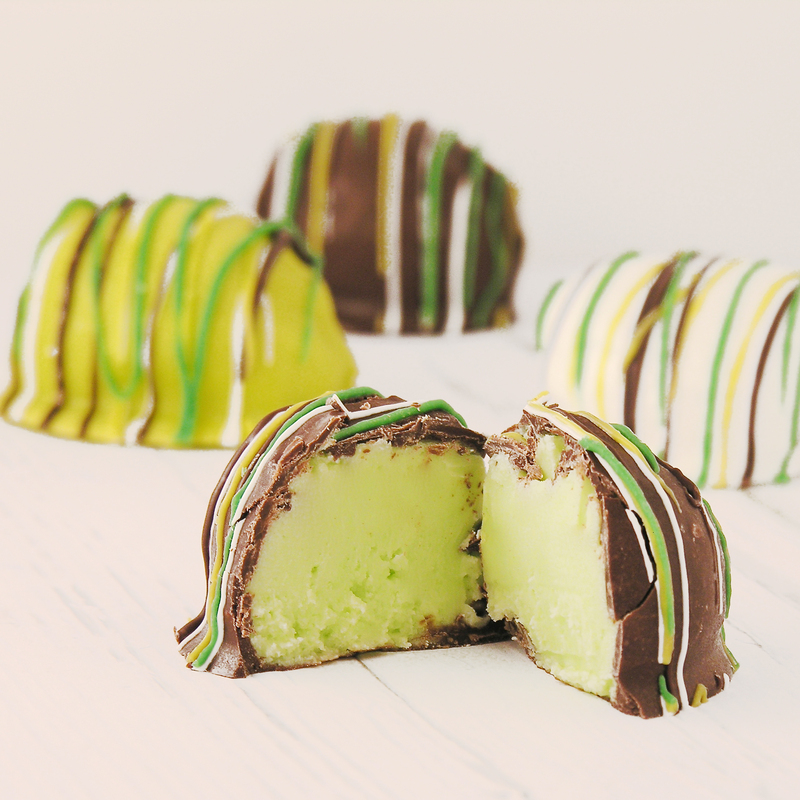 These fun truffles are made with green apple (or lime!) Kool Aid filling and they are SO yummy! It’s the time of year when all things green are made. One of my favorite truffle fillings is made with Kool Aid, which makes the flavors limited only to what little packets of flavor you can find! I made these with green apple Kool Aid, but I’ve made them with lime before too- and they are delicious! This tart fruit filling is SO creamy and smooth. I absolutely love it! Melt the Wilton’s Candy Melts in the microwave in 30 second increments, stirring until smooth and creamy. Dip chilled balls of filling in the melted chocolate, draining away excess and placing on parchment paper to harden (if you want pictures of how I dip things click here for a previous recipe) The balls of filling need to stay cold, so keep them in the fridge until you are ready to dip them. 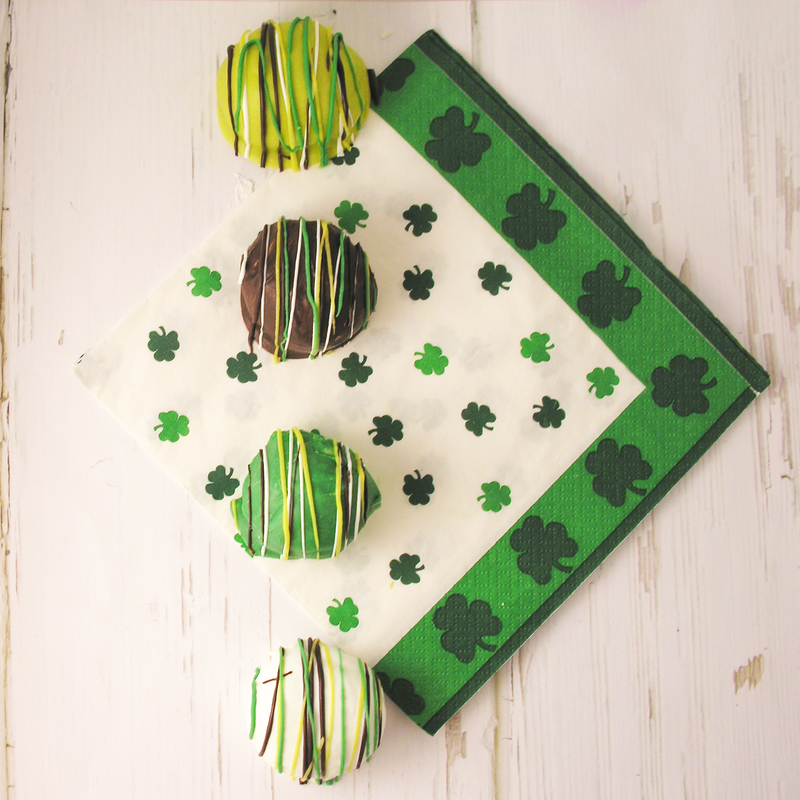 Decorate with drizzles of fun colored chocolate. My thoughts: Aren’t they cute? They are SO yummy too… my only recipe tip is to make sure those balls of filling are chilled and your melted candy isn’t super hot. I allowed my candy melts to cool a bit before I dipped. You just don’t want that soft filling to start melting while you dip. 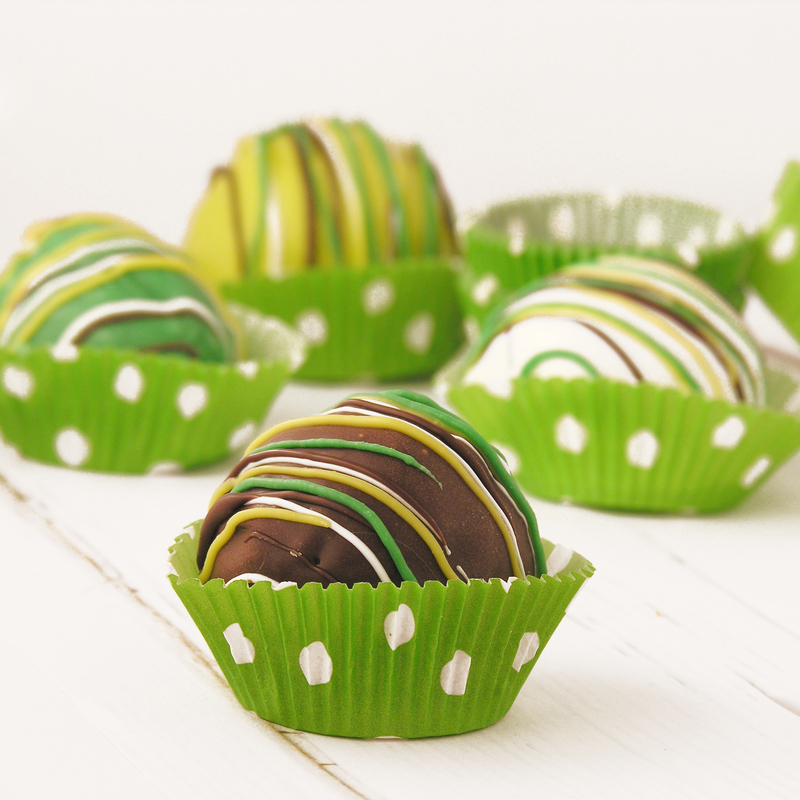 These are as fun as can be using all sorts of fillings, which makes them a good treat for any holiday! Here they are in other fun flavors. Click on the photo to see how I did them! 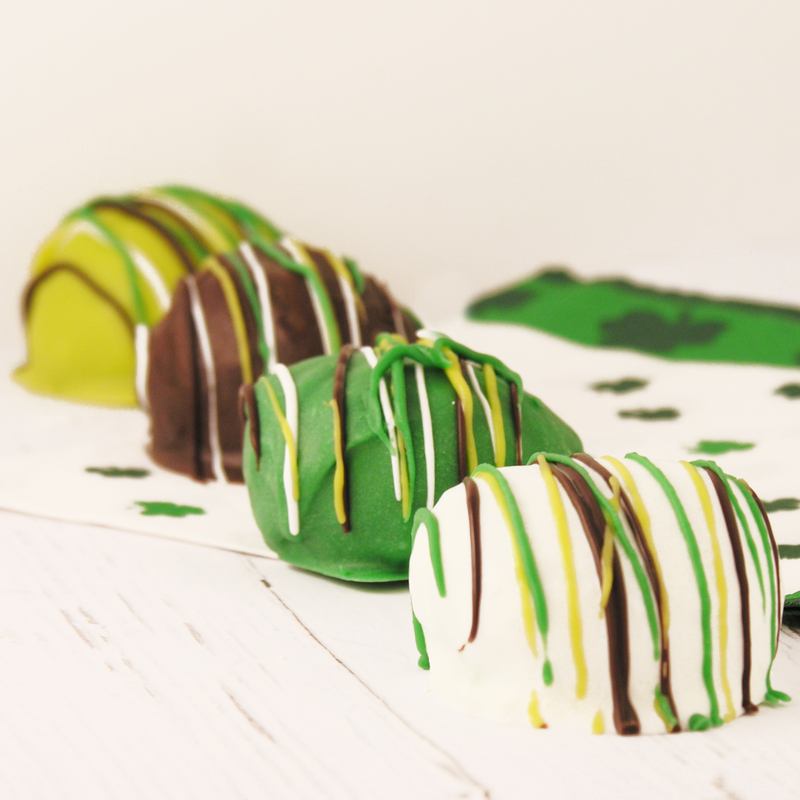 Posted in Uncategorized and tagged best, candy, chocolate, Cream Cheese, creative, dessert, filling, fun, green apple, holiday, kool-aid, Kool-Aid dessert, Kool-Aid recipe, leprechaun, lime, recipe, St. Patricks Day, Truffle, white chocolate chips. Bookmark the permalink. I love these truffles! They look so festive and pretty, too! oMY these are so adorable!!! And so perfect for St. Patrick’s day!!! You’re so talented. Dreams of cupcakes are the best dreams ever. I always have those kind when I am on a diet! Such a smart idea to use kool-aid. It’s my first time hearing of it! Thank you! I love using Kool Aid to flavor things- frostings, fillings, cake… It comes in such fun flavors and colors and the small packets don’t have sugar added yet, so it really is just a packet of flavor.